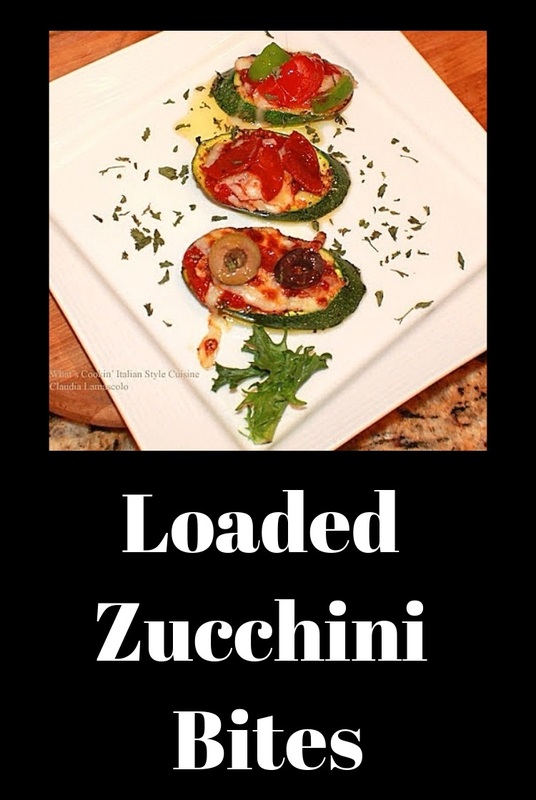 Loaded zucchini pizza bites are the perfect solution for a dieter. 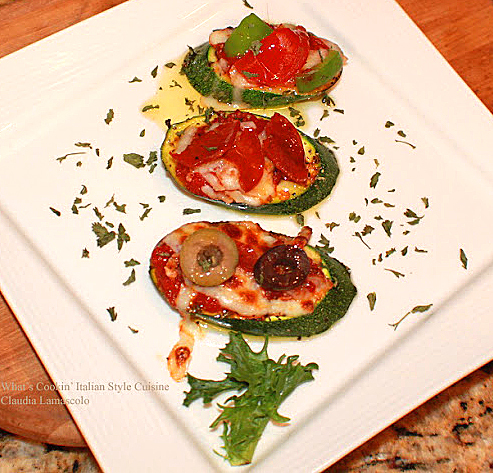 You will have a low carb delicious appetizer that you can adapt any way you like. Loaded zucchini bites are also a great party appetizer and snack late in the evening instead of unhealthy snack foods. You can make them a whole meal depending on the many kinds of toppings you choose. Whether all vegetarian or meat lover, this is a pizza tasting sensation of the summer! The reason I love loaded zucchini bites is I can eat many of them and not feel the guilt of all those carbs in regular pizza that turn in sugary fat! I just leave mine plain with low fat mozzarella and some Romano cheese, salt, pepper (sometimes I add mushrooms and peppers) and I am good to go! Anyway you love your pizza top this zucchini with. What a delicious alternative Loaded Zucchini Bites are! Try them soon! I just love the variety you can come up with. We have tried all different kinds. Chicken being a favorite here. We love to top them with buffalo chicken. That is a great game day snack. We use cooked chicken buffalo sauce and sharp cheddar, that's it. Buffalo zucchini bites are a great change to the tomato sauce kind. We have also made them with barbecue chicken and melted cheese. All flavors on zucchini bites are terrific. Try some with leftover cooked steak also! How awesome are these to make however you like pizza? Baked too? Easy to make delicious to eat! Loaded zucchini bites are my new favorite snack food! Spoon a small amount of sauce on zucchini slices, topped with spices and herbs. Bake around 10 minutes to slightly soften before adding the cheese on top. Topping suggestions:any cooked meats IE: chicken, steak, pepperoni, sausage cooked and drained, sliced meatballs,finely chopped garlic, eggplant diced, artichoke hearts chopped, feta cheese or any kind of cheeses your prefer, spinach, cubed tomatoes, olives, ricotta cheese, mushrooms, peppers sliced thin, chopped shrimp or any of your favorite pizza toppings. Add your own sauces like barbecue to chicken, hot sauce on chicken or even Asian style sauces for a change! You can even use steak or hamburger with blue cheese dressing on top! Preheat oven on 400 degrees. 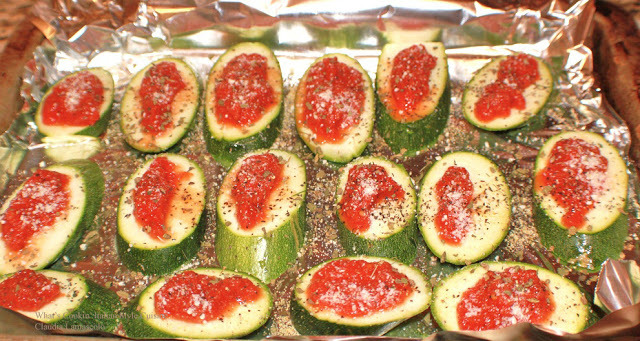 Place slices of zucchini on a aluminum foil oiled sprayed cookie sheet. Top with sauce and grating cheese, sprinkle with a little of each herb and spice. Bake on 400 degree hot oven for 10 to 12 minutes, pierce with a fork to see if they are tender. Remove from oven. Top with mozzarella cheese and your favorite topping suggestions. Drizzle with olive oil and put under a broiler until golden browned and cheese melts. So many topping options and they all sound marvelous!